Home » ALL ELSE » Kong on the Planet of the Apes, an epic crossover in comics will happen. Kong on the Planet of the Apes, an epic crossover in comics will happen. This new six-issue series will be a first for the two worlds as writer Ryan Ferrier (Mighty Morphin Power Rangers, Kennel Block Blues) and artist Carlos Magno (Planet of the Apes, Kong of Skull Island) team-up to deliver an epic story starring the best-known primates in pop culture. BOOM! Studios’ Kong comics are based on Joe DeVito’s Skull Island and Merian C. Cooper’s King Kong. The publisher recently completed a 12-issue series, Kong of Skull Island, written by James Asmus (All-New Inhumans) and illustrated by Carlos Magno. BOOM! Studios continues to publish Planet of the Apes comics since 2011, the longest-running comic book adaptation of the property (with comics produced on both the original and current series of films). 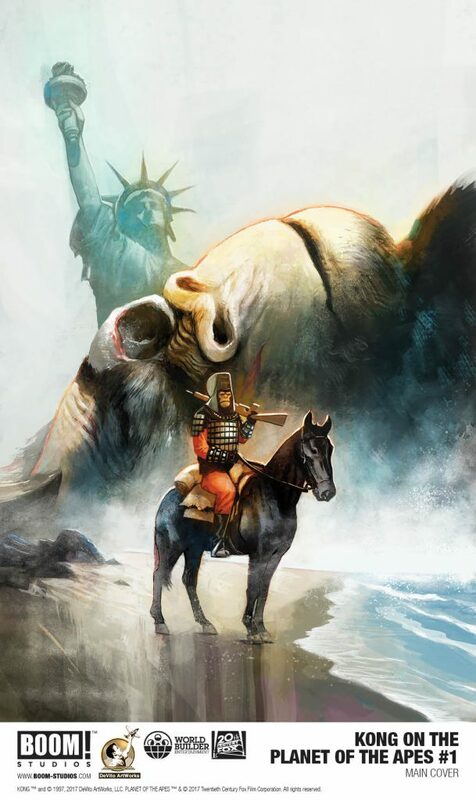 War for the Planet of the Apes is currently out, as a four-issue series by David F. Walker (Luke Cage) and Jonas Scharf (Warlords of Appalachia), set before the Fox film. Kong on the Planet of the Apes #1 hits the comic book shops and popular comic digital apps in November.